Devoid Of Culture And Indifferent To The Arts: Lost & Found Recipe: Sushi Rice Dinner, where everything's cooked! 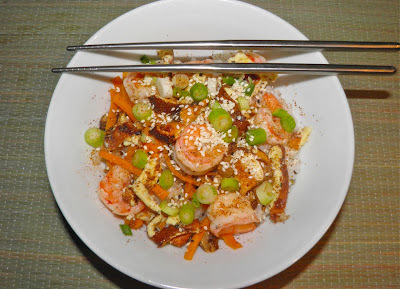 Lost & Found Recipe: Sushi Rice Dinner, where everything's cooked! Not lost any more! This food craving can now be fulfilled once again. There should be a law: if your restaurant closes down (and you don’t intend to stay in the business) all your recipes should become public property. How’s that sound? Probably a bit radical, eh? It’s just I’m more than a little tired of falling in love with a particular dish at a particular restaurant only to have it ripped away from me because someone doesn’t have any business sense. This happens all the time and I’m sure many of my readers agree that it’s an annoyance, to say the least. It’s not easy to resurrect a restaurant meal from memory. I have the battle scars to prove it. Often there’s hidden ingredients that make or break a recipe but aren’t readily discernible. It’s trial and error until you get it exactly right. Luckily, this time I did! This particular rice bowl is from a sushi take out place in Halifax that closed down nearly a decade ago. Their sushi was OK (I’ve had better) but this particular dish for sushi rice topped with shrimp was exceptional and not available quite the same anywhere else. I believe they called it sushi rice dinner, but it referred more to the bed of rice than anything else since everything on top was cooked. Accompanying the shrimp was egg pancake, shiitake mushrooms and carrots. It was very filling and actually on the inexpensive side. That made it a godsend for nights when I taught at NSCAD and didn’t get out of class until after 9pm. It was fast, cheap and good. On top of all the “fixin’s” was sprinkled this amazing ground red stuff. It was this recipe's "mystery ingredient." After a good deal of exploration in the local Asian market I found it. 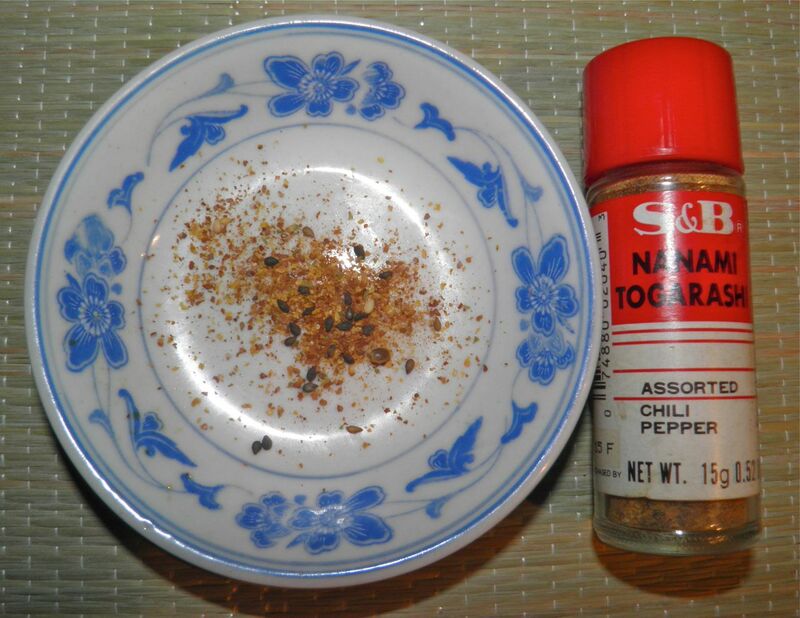 The product is nanami togarashi, a mixture of different ingredients depending on manufacturer, one or more of which is chilli pepper. Nanami togarashi. The black bits are black sesame seeds. This ground chilli concoction is excellent sprinkled on top of food. It’s the flavour that makes this dish come alive. You can possibly find it in groceries that have an extensive international section or look in an Asian or Japanese specialty shop. It would be there for sure. I have to say, my re-imagined recipe was even better than what I remember. The flavours were bang on, but since all the toppings were prepared fresh (and more of them) it far surpassed what I used to buy. This is definitely now in my meal rotation. 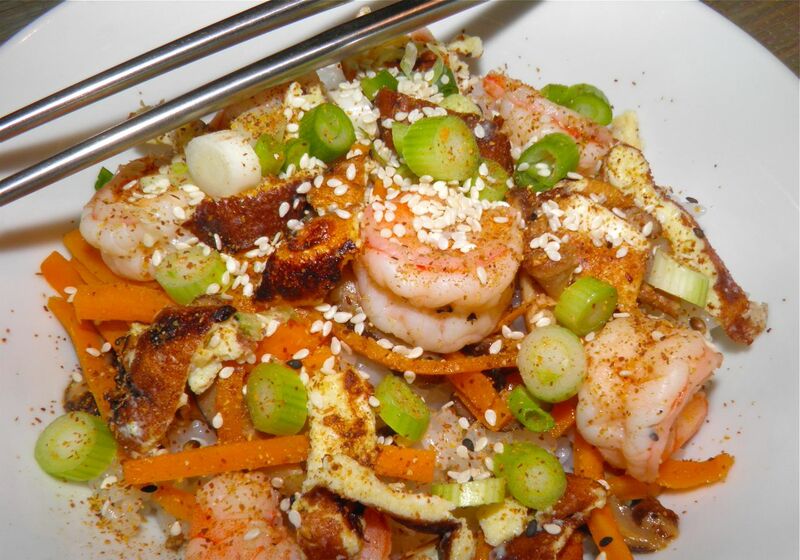 Shrimp, mushrooms, egg pancake and carrots. All atop seasoned sushi rice. This was good, good, good. Reconstitute the dried mushrooms in enough very hot water to cover. This can be hot tap water. Just make sure it’s piping hot. Let sit for 20 minutes. Drain and cut the mushrooms into thin slices. Set aside. While the mushrooms are soaking, make the rice. 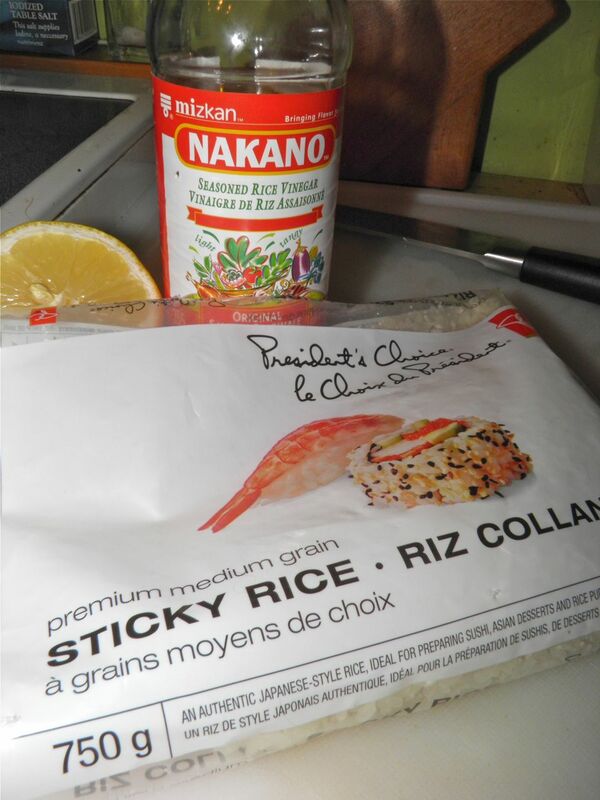 Prepare the sushi rice according to the package directions, substituting 1/4 cup of the water with seasoned rice vinegar. Bring the water, rice vinegar, 1/2 tsp salt and sugar to a boil. 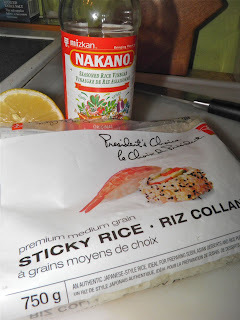 Rinse the sushi rice several times, then add the rice. Stir well, cover and reduce the heat to simmer. Let simmer for 15 minutes (or directed time on your package). Then remove from the heat and allow the rice to sit, still covered, for at least 5 minutes more. Meanwhile, beat the two eggs in a small bowl with the remaining tbsp of sushi vinegar and 1/4 tsp of salt. Heat a non-stick pan and pour in the eggs and cook to make a thin omelet. Remove the omelet, roll it up tight and slice in thin pieces. Set aside. Pare and slice the carrot into thin matchsticks and add to the sliced mushrooms. Peel the shrimp. Heat the sesame oil in a frying pan (or wok) and add the mushrooms and carrots. Fry for about 2 minutes. Then add the shrimp. Sprinkle with the remaining 1/4 tsp salt and remaining 1 tbsp of rice vinegar. Sauté until the shrimp are no longer pink and the vinegar has evaporated. Slice the green onions into rings. To assemble, spoon out the sushi rice into four bowls. Divide the egg, mushrooms, carrots and shrimp evenly over the top. Sprinkle with the togarashi, green onions and sesame seeds. Drizzle with some more sushi vinegar if desired. Serve with chopsticks while the rice is still warm.